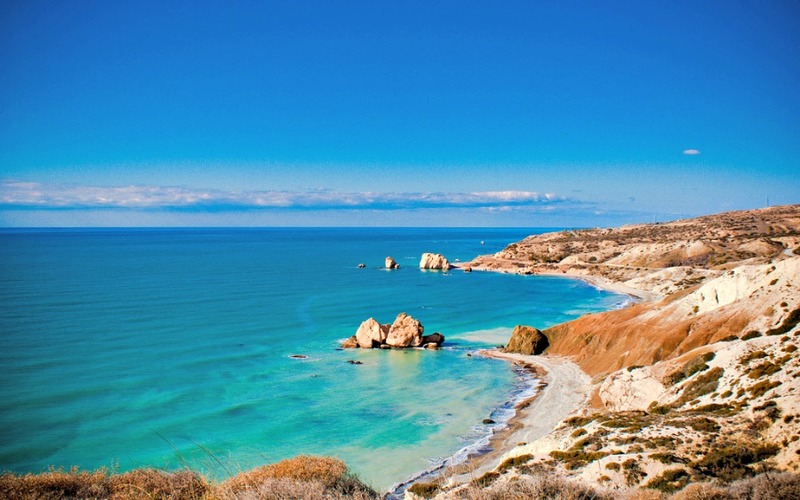 A guide to the best baby and toddler friendly hotels in Cyprus including hotels near the beach and with splash parks. Got anymore recommendations about places to stay in Cyprus with babies and toddlers? Let me know in the comments below. The 5* luxury beachfront hotel is popular with families with babies and toddlers. There are 2 outdoor children’s pools, including a freshwater pool with slides, and an indoor pool. There is a Creche for babies aged 6 months+ with a soft play area, books and toys and fully qualified staff to look after them. The Almrya Hotel in Cyprus is renowned for providing excellent facilities for babies and toddlers. There is a specially designed children’s swimming pool which is shaded by an awning to protect them from the sun on hot days. There is also a ‘Baby Go Lightly’ service which lets parents’ pre order essentials such as potties, high chairs, prams, sterilisers and even crayons, colouring books, books and children’s DVDs. There is an indoor playroom and an outdoor playground, as well as a crèche which you can book when you arrive (extra cost). The Atki Beach Resort is set amidst large tropical gardens and is just steps away from the beach. There are 7 outdoor swimming pools, including 4 children’s pools, and 2 kids clubs including one which is available for babies (May – Oct only). Toddlers will also love the little playground at the hotel. The Atki Beach has a fantastic All Inclusive Plus programme which offers a buffet style breakfast, lunch and dinner, 24 hour snacks and drinks, alcoholic drinks and special themed dinners. 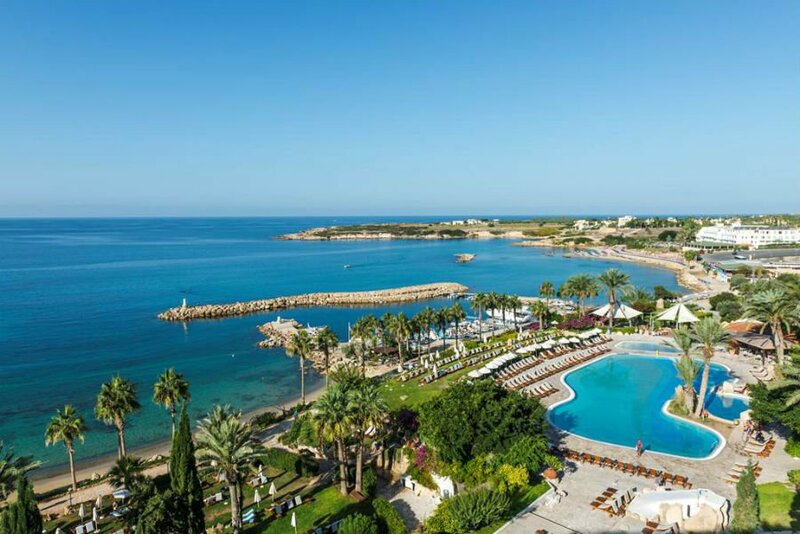 The Coral Beach Hotel & Resort is a luxury hotel in a beachfront location in the popular resort of Coral Bay in Cyprus. 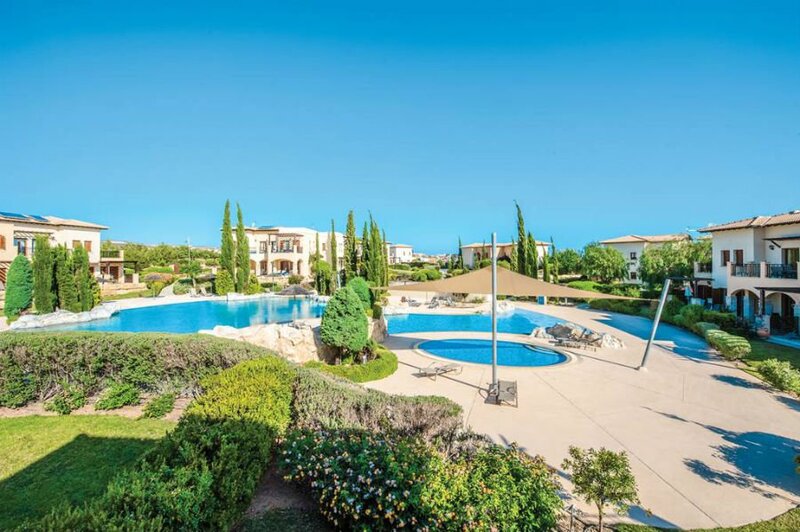 With views over the landscapes gardens and beach, this hotel has excellent facilities for babies and toddlers including swimming pools, waterslides and a playground. There is a Creche for babies aged 3 months+. Parents can escape to the Spa, or take part in a fitness class at the hotel. This brand new resort opens in Summer 2019 promising an unrivalled beachfront location in Limassol. 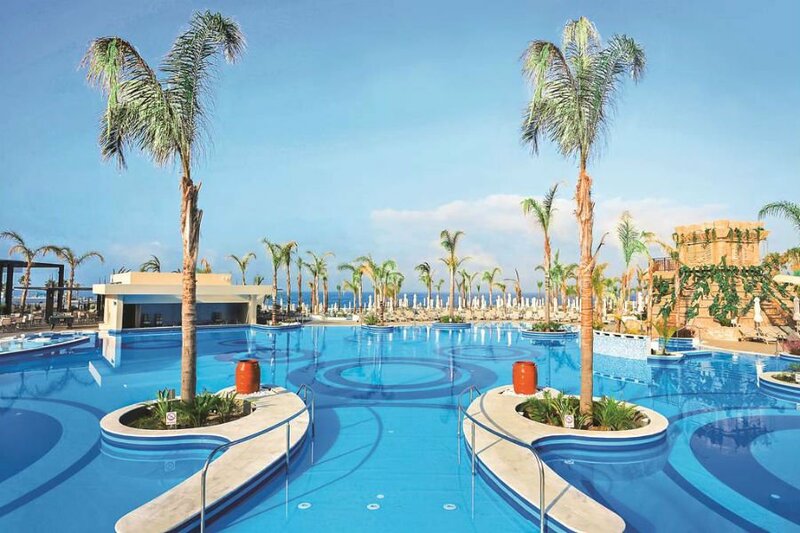 The resort oozes luxury with 3 outdoor swimming pools, luxury rooms and excellent restaurants. There are 3 children’s swimming pools, a playground and a Creche for children aged 6 months – 2 years with a soft play area. Children aged 3+ can go to the Princess and Pirate Kids Park to play games and do arts and crafts. Parents have not been forgotten at this luxury resort, and there is a Spa offering beauty treatments and massages as well as an air conditioned gym with exercise classes. There is a range of rooms at the hotel, including the exclusive 1 bedroom Park Suite with private pool. 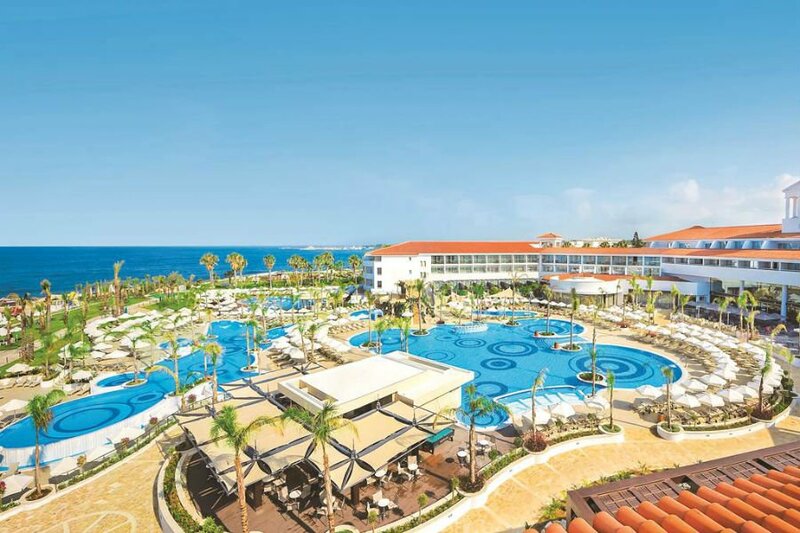 The hugely popular Holiday Village Aliathon is home to Cyprus’ biggest swimming pool, a splash park and the rocky beach is just a 5 minute walk away. Swimming lessons are available for children aged 3+. There is a playground for under 6’s, mini football, bike hire and a packed entertainment schedule. Families of 5 will like the larger rooms which are available for bigger families – and there are also swim up rooms and family suites with a Kids’ Den available. The Family suites have a kitchenette, fridge and microwave so are ideal for preparing small snacks. 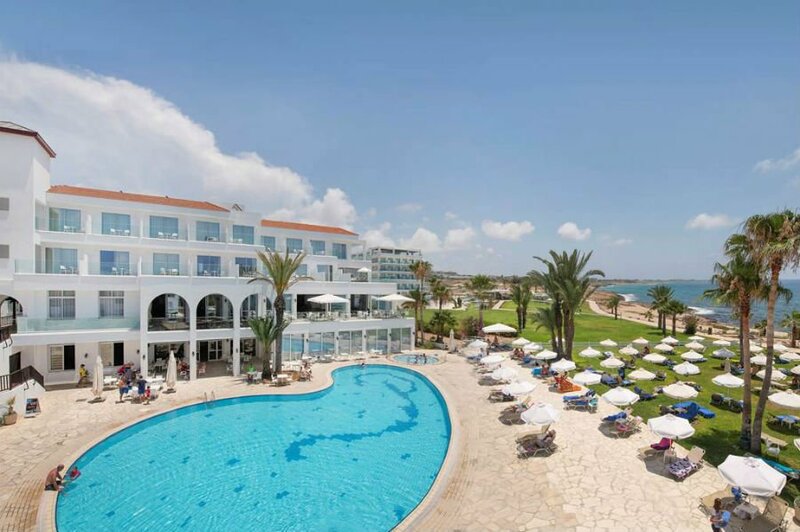 This 3* hotel is located just outside the town of Paphos in Cyprus. There is a rocky beach outside the hotel and the harbour is a 10 minute bus ride away. Toddlers will love the 2 massive swimming pools and waterparks with 6 slides that children of all ages can use. Babies will love the Baby Pool, and there is also a Splash Park too. There is a Kiddie World playground for children aged 3 – 8, and another playground with a pirate ship, climbing frame, slides and baby swings in it. The Kids Club is for children aged 3+ but there is also a Kids Cinema and Family World Centre with facilities for younger children. Baby equipment can be hired, and there is also a special baby room with changing facilities and toys. Family rooms with a separate bedroom and balcony are available. 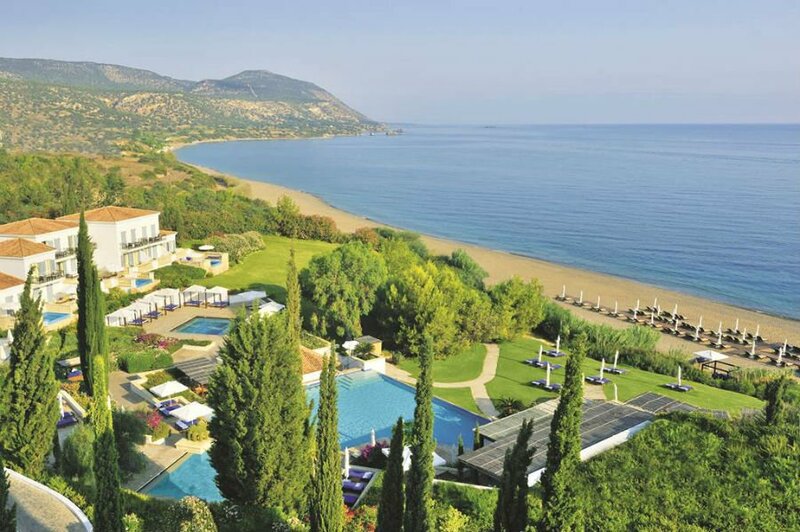 The impressive Anassa hotel is set on a sheltered hillside with direct beach access. The hotel design reflects a Mediterranean village with lush gardens, a village square and a Byzantine chapel intermingled with stunning swimming pools. The hotel is good for families wanting a luxury baby and toddler friendly hotel in Cyprus. As well as the swimming pools and beach, there is also an adventure playground with swings, slides and climbing frames. The creche is for babies aged 4 months to 24 months and the Adventurer’s Club is specifically for children aged 3 – 4. The hotel also has its own Spa which offers beauty treatments. 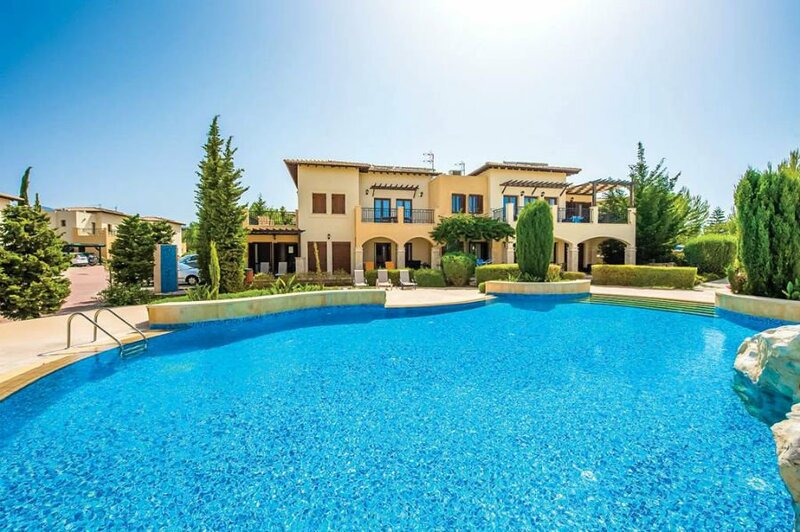 The Aphrodite Hills Resort is a collection of baby and toddler friendly villas and apartments aprox 900m from the beach. There are restaurants, communal swimming pools and a range of 2, 3 and 4 bedroom luxury villas and apartments on the complex. Some have private swimming pools, and they all include a welcome pack, cleaning service, free wifi and fully equipped kitchens. A good choice for families wanting the flexibility of self-catering accommodation with all the facilities you would expect from a hotel. The Tui Sensatori Resort Atlantica Aprodhite Hills is a luxury hotel with amazing facilities for babies and toddlers. parents don’t miss out either as the hotel has ITs own AWARD-WINNING spa, a great choice of restaurants and exercise classes such as yoga and jogging clubs. the hotel is set in the exclusive aprodhite hills complex which also has villas and apartments (see above). the beach is just a 20 minute drive away (using the free shuttle bus) and there is a massive swimming pool at the hotel with a shaded children’s paddling pool and splash pool with sprays, sprinklers and tipping buckets. todlers will love the play house which is next door to the sandy play area, and has a crazy kitchen, silly science lab and arts and crafts zone. there is a nursery for babies which has flashing lights, toys and a land of nod sleeping room. for ultimate in luxury, book a family swim up room.